I purchased this carrier from Lagoon Baby at 15% off during their Black Friday sale in November of 2016. It arrived very quickly, in fact it was delivered on a Sunday by Canada Post about 48 hours after ordering! Totally shocking speed. My package included a brochure and wearing instructions. My initial impression was that this Woven Material was incredibly soft and luxurious but still felt sturdy. I could instantly see why so many mamas are passionate about Woven Wraps, because the Fly Tai is essentially made out of one. This is my first time seeing and feeling woven wrap material in person. I was curious about Woven Wraps but felt I should start with a Woven Meh Dai style carrier first, before diving into the woven wrap realm. 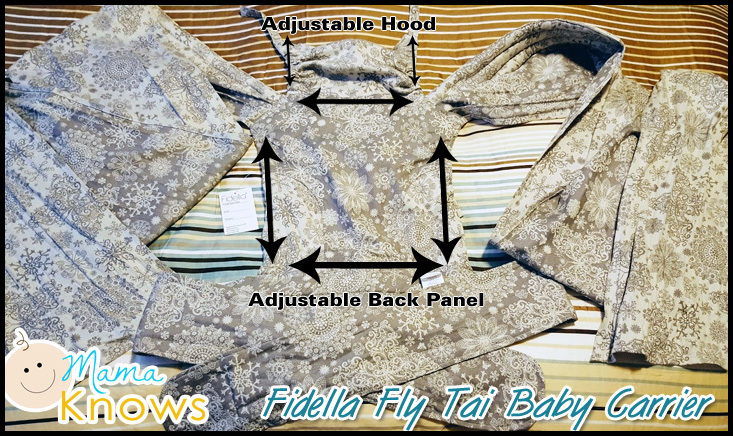 Having the panel fully adjustable and the straps both padded and wrap-style, I can see that the Fidella Fly Tai is a fantastic bridge between Soft Structured Carrier and Woven Wrap. The drawstring-like adjustability of this carrier is both unique and practical. 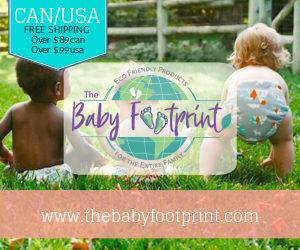 I was able to get a perfect fit on my baby from day one which enabled him to be safe, cozy and content. Simply pull the strings on either side of the back panel to adjust height, then tie them off. You want the height of the panel to reach the top of your baby’s neck. For the width of the panel, you can adjust at the belt level, as well as the baby’s neck level. 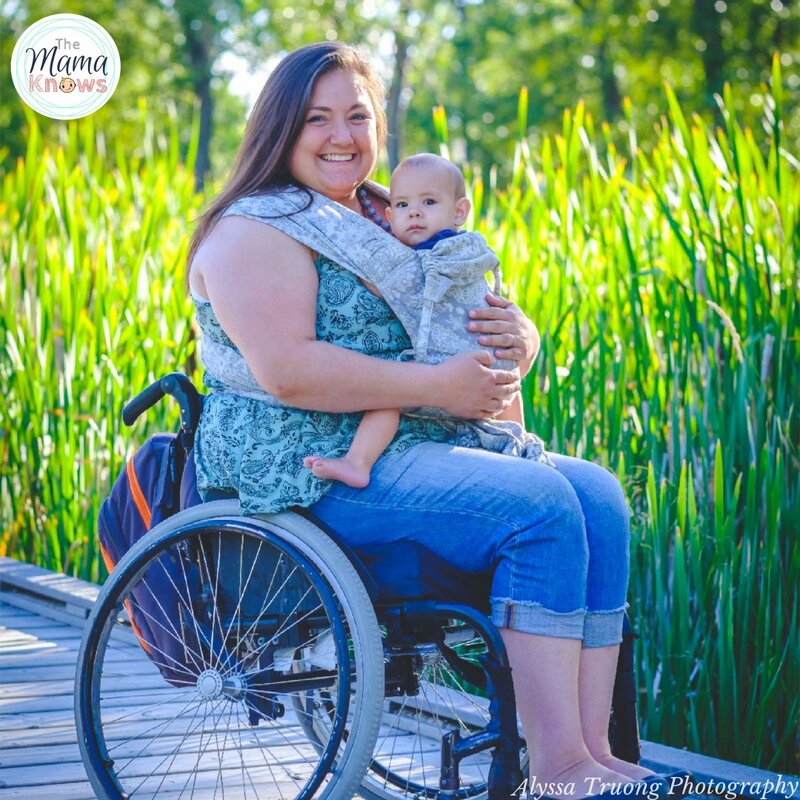 Adjust the bottom of the panel to ensure it reaches from baby’s knee to knee while they are seated in a “froggy” position. Adjust the top width of the panel to provide snug support of baby’s head and neck. Use the hood for additional head support as needed! 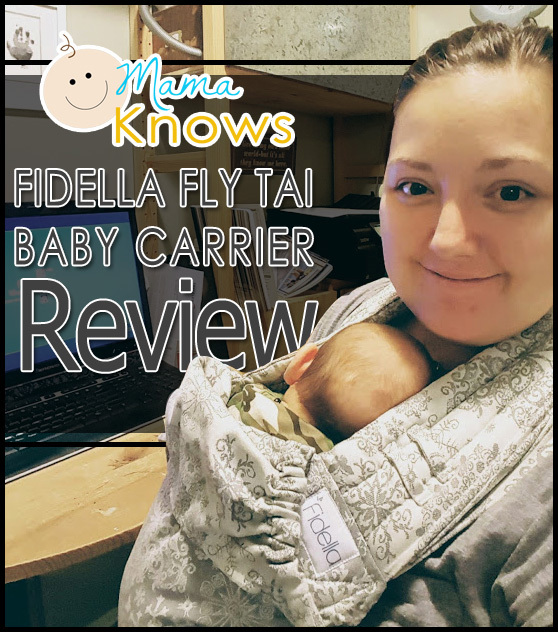 This carrier fits Moms, Dads and siblings too! Literally a “one size wears all” carrier. Because the straps are totally adjustable, this carrier fits size XS to XXL with ease. 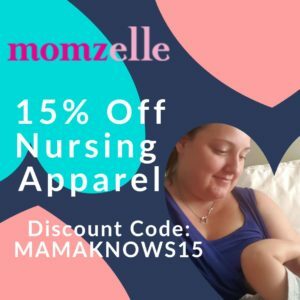 I am a plus size mama (size 18) and it is very comfortable. My 12 year old son is 5’3″ and 100 lbs and the carrier fits him perfectly as well. My burly husband is also quite well accommodated and these straps provide great support on his beefy shoulders. There are many different carry and finish options for this carrier, including front and back carries. I will share with you a video by Wrap You In Love that ultimately convinced me to buy this particular carrier. The way that she tightens the wrap straps “strand by strand” is essential to your comfort in this carrier. It will provide you with phenomenal support. 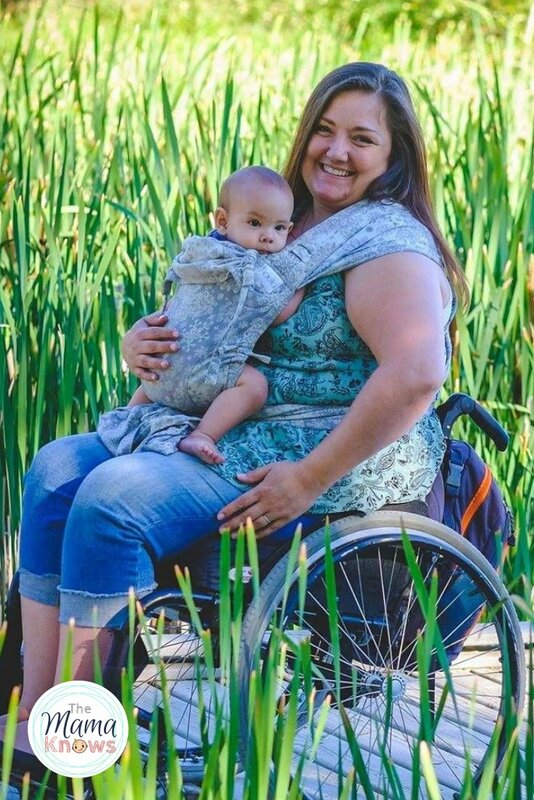 She has many videos that show great carry ideas for a Meh Dai/Wrap Tai style carrier like this one. Check out this Fly Tai Back Carry video as well. I myself tried the Back Carry and it was surprisingly easy, even with a 2.5 month old. 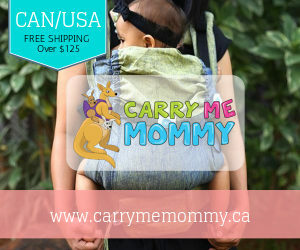 If you are in the market for a new Baby Carrier, and perhaps want something more adjustable and supportive than a Soft Structured Carrier, this is a great choice. You will hear many people say that a woven wrap is the most supportive option out there, but if you can’t fathom jumping into the Woven Wrap world just yet, I highly recommend this Meh Dai style wrap strap carrier. The straps are overwhelming at first, but I quickly found myself adjusting to having so much length. After a month of daily use, this has become my very favourite carrier. Accessibility Notes: I am able to wear this in my wheelchair without issue and it doesn’t strain my back. I can also wear it standing and walking with cane or crutches. this is a very interesting style , i think i’m the person in your final verdict. thank you for sharing this very helpful review. I’m happy my review is helpful to you! Thank you for your comment. this looks like a great carrier. I haven’t heard of this brand before, but their shipping department sounds like they are on it! lol I have tried woven in the past and couldn’t get the hang of it, so I’ve always used a structured carrier. I’d love to try something like this since it sounds much softer though. I love that it is padded around babies legs, the straps, and waist. It definitely sounds like it would be more comfortable than other options out there. We haven’t tried this style of carrier yet, but it seems like it would more light weight and cooler to wear for both baby & carrier. I also like that it seems easy to adjust and put on by different people. We might need to look into one for baby #2.